Your Ultimate Tee Guide: How to Style T Shirts like a Pro? A T-shirt is something that we all love to stock up in our everyday fashion wardrobe. The amount of comfort and ease that it offers, makes it everybody’s favorite spring/summer staple. Don’t just confine it to your bedtime or to the gym. This is a piece that can actually infuse a touch of coolness when paired with other polished ensembles. Before we move on with some of the chicest basic t-shirt outfit ideas, let’s just know a few simple rules to flaunt a basic tee like a pro. When your top is a tee, the bottom must be something in contrast. With a lighter hued tee or plain white t-shirt, prefer dark-washed jeans or darkly colored bottoms. It helps in popping each outfit fashionably. The length of a tee shirt is also imperative (irrespective of gender). Wearing something boxy or too short can reveal the flash on leaning forward. So, just go with medium size that hits around your waistband. Always consider your body type while buying tees for you. Instead of following the standards of beauty, look for the style that matches your body shape. For females, it is always a pleasing experience to buy a tee as they come in a great variety of cuts as compared to men’s. All that you need to do is to focus on your most favorite body part or the area that you want to highlight, and buy a t shirt accordingly. For instance, if you find your arms attractive, you can opt for shorter than average lengths of sleeves. If your legs are your forte, go ahead with oversized t shirt (as a dress) and expose your legs aesthetically. Choice of colors is yet another aspect that makes the difference. Darker shades like navy, black and brown are recommended for those who are conscious about their upper body part—darker shades tend to hide the upper body area. Contrarily, if you want to accentuate your curves, just opt for lighter tones like orange, red and yellow. You can pick out any color that goes right with your skin tone. Can a casual outfit like a basic tee be accessorized? Yes! Tees are casual but addition of some brightly hued fashion accessories like a handbag or shoes can add a fancy flair. Plain tee shirts are the staples that can easily be worn in a number of styles. It can be paired with a long maxi dress, over a pencil skirt with a cardigan on, over a denim trouser layered with blazer or with a printed kimono over it. To tuck it or not; that is the most controversial question in the domain of tees. There was a time when tucking a tee was not less than a taboo. But now as fashion shows and catwalks are getting common, we are seeing tucking as the latest trend. Read on to find more. Tucking in just the front of the tee is a cool idea. 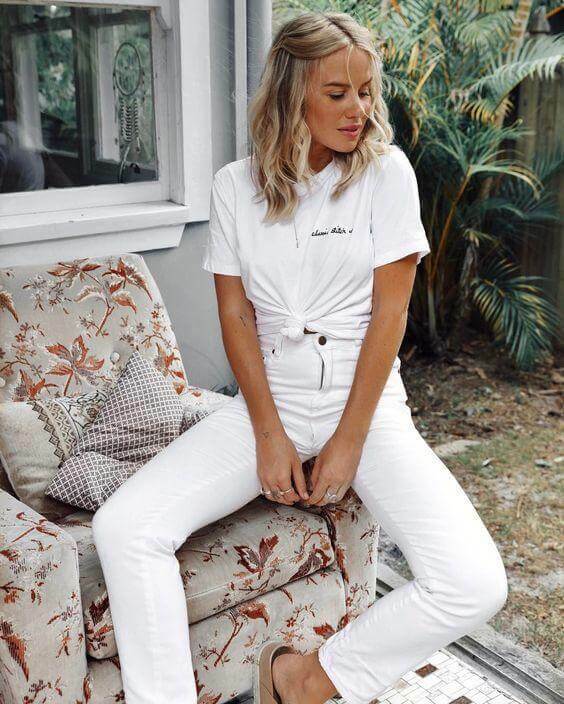 Still if you wish to tuck it all, it is always good to pull off plain t-shirts like plain white tees, plain black t-shirts or any other simple tee preferably in light hues, for a minimal style. When you layer up a cool or unstructured blazer or jacket over a tee (for guys it could be a leather or denim jacket), it not just adds more to your overall style; but it also downplays the tucked in look. The only point to remember is to settle on a contrasting color for your jacket. Avoid pulling off a super tight tee—especially if you do not have a flat tummy—overexposed midriff does not seem pleasing to eyes. Secondly, as it is about the hotter months of the year, a tee should always be a good fit that allows the air to pass between the fabric and your torso. Those of you who are overweight and petite must not wear tees with crew or boatneck. It tends to add more to you horizontally. Contrary to that, we would recommend you to wear v neck t shirts—they draw the focus inwards, making you look slimmer. Tees are a basic outfit and we do not recommend it for professional kind of atmosphere. There are no hard and fast rules for wearing a basic white tee—just get it partnered with anything that promises comfort without any compromise on style. Scroll down to know some of the chicest and comfiest tee-based outfits to make your summer stylish. Plain white tees are something that we all own. You don’t know how to pull it off? Just get an easy-peasy monochromatic look by pairing it up with white jeans. Add sneakers to compliment the look. We have seen it on fashion shows like Christian Dior earlier. It is still going very strong. 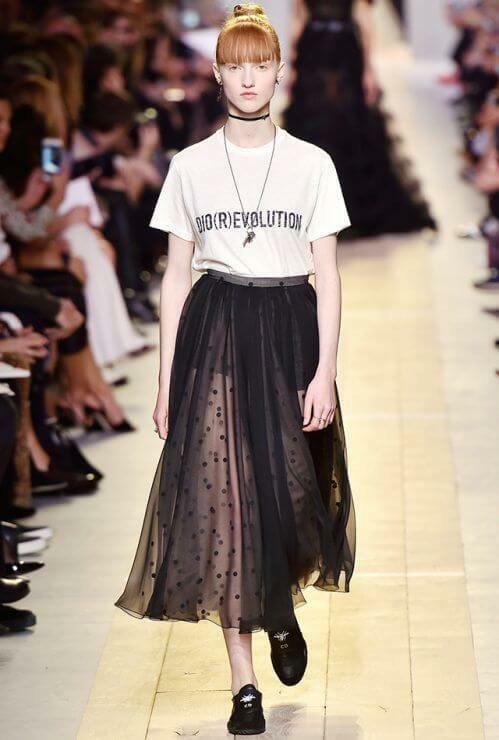 Keeping in view the intensity of weather, the combo of tee with a tulle semi-sheer skirt promises a flawless look. Move on in style with the trendiest printed high-waisted trousers, paired with a comfy tee. To avoid a loose look, just opt for a nifty knot in front of the tee. The image says it all. Try out the combination of a black t-shirt and black fringed skirt. We recommend this preppy look for fun-filled weekend parties. What is your take on it? Cutely printed and cool t-shirts can be incorporated with sporty and casual shorts. This combo is best for the days when you are not feeling like doing anything. Look at the image for visual advice. Basic V neck tee usually comes with plunging neckline—casualness and boldness side by side. It can be worn just with denim trouser or by layering up with some blazer. To adorn that ‘V’ shape, don’t forget to flaunt some long and stylish neckpiece. Buying an oversized t-shirt (preferably tees with graphic prints) is just like buying a dress for you. You do not want to pair it with anything, no worries, just pull off a shirt dress look—an amazing fashion staple for summer. For windy mornings, try out a denim jacket over it. Sneakers and ankle boots are best footwear options to try. Your tee can make a great partner for your sassy slip dress. Just wear it underneath the slip dress and get a sultry summer avatar. Slogan t-shirts are the coolest pieces to have in summer. Handpick some cute t shirts with interesting slogans over it and pair it with your well-fitted denim shorts. Girls who aspire to have a wild or bold look in summer, must pair up a band tee tucked in a destroyed denim—check out the wildcat lady Gaga. Tees are one of the most versatile basic outfits that can be styled differently. We hope that the tee guide given above would have added more to your fashion lessons for tee shirts.